Gangs’ territorial control affects the lives of residents in thousands of neighborhoods across Latin America, particularly in northern Central American countries. I argue that gang dominance constrains the ability of neighborhood residents to mobilize politically and consequently resist gang violence through institutionalized channels. Living in gang-controlled neighborhoods results in fewer incentives and opportunities to make political elites accountable for one’s personal safety. Even residents who have already experienced crime firsthand are discouraged from turning to politics as a strategy to change the status quo. My theoretical insights identify mechanisms through which gangs’ neighborhood control affects nonelectoral and electoral participation. To test my hypotheses, I rely on census and public opinion data collected in seventy-one neighborhoods in El Salvador. This article offers the first systematic statistical analysis of the effect of gangs’ territorial control on political participation in the Latin American context. The findings suggest that living under gang rule undermines residents’ right to engage freely in politics in nuanced ways. El control territorial de pandillas afecta a residentes en miles de barrios en toda América Latina, particularmente en países en el área norte de Centroamérica. El control territorial limita la movilización política, y por lo tanto la posibilidad de resistir la violencia criminal utilizando mecanismos institucionalizados. Vivir en un barrio controlado limita la probabilidad que los ciudadanos demanden mejoras a su seguridad personal. Aún quien ha sido víctima del crimen, no tiene el incentivo de involucrarse en política para tratar de cambiar el statu quo. Se identifican mecanismos por medio de los cuales el control territorial afecta la participación electoral y no electoral. Se utilizan datos de opinión pública y de censo en setenta y un barrios en El Salvador. Por lo que se ofrece el primer análisis estadístico sistemático del efecto que tiene el control territorial por pandillas sobre la participación política en el contexto latinoamericano. Los resultados sugieren que el vivir bajo el dominio de pandillas socava el derecho ciudadano de involucrarse libremente en política. As the third wave of democracy swept through the developing world, hopes for peace and security rose. This idyllic expectation was soon met with an unprecedented wave of violence (e.g., Trejo and Ley 2018). High levels of criminal violence have positioned the Latin American region as the most violent in the world (UNODC 2013). Criminal violence is particularly high in northern Central American countries (El Salvador, Guatemala, and Honduras), where gangs (maras) are largely responsible for homicides, extortion, and other criminal activities (Hiskey et al. 2018). Similar to other nonstate armed groups, such as guerrillas and drug cartels (e.g., Arjona 2017a; Durán-Martínez 2018; Kalyvas 2006), territorial control is fundamental for gang survival, which has resulted in thousands of neighborhoods under gang rule.1 With a focus on El Salvador, I argue that gang dominance in Central American neighborhoods makes it less likely that neighborhood residents, even those who have been victims of crime, will resort to political mobilization as a strategy to resist gang violence. Social resistance to criminal violence involves opposing an armed group (Arjona 2017b; Moncada, forthcoming); one channel of resistance is through politics, requiring citizens to become actively involved (Davis 2012). Previous literature suggests that individuals who have personally experienced crime are particularly inclined to engage in politics (e.g., Bateson 2012) and consequently to be the principal actors of social resistance (Arjona 2017b). I posit that, in neighborhoods where gangs exert a high degree of territorial control, engaging in politics freely becomes less of an option for most residents, including crime victims. By contrast, in neighborhoods with relatively low levels of gang dominance, crime victims are more likely to resort to political participation as a strategy to condemn and prevent criminal violence. I theorize that gang dominance in neighborhoods undermines residents’ ability to freely exercise their political rights and participate in politics. In neighborhoods they control, gangs have an incentive to actively deter, monitor, and punish political participation, especially when it entails close contact and engagement with political elites, which poses the greatest threat to their survival. Gang members fear that residents’ close relationships or encounters with political elites will result in dissemination of information about their identities and operations. Compared to neighborhoods with low gang control, in neighborhoods ruled by gangs we should observe lower participation rates in these types of political activities, among both crime victims and nonvictims. Furthermore, I argue that the mechanisms through which gang control affects voter turnout are more nuanced. Voting is a relatively infrequent activity that does not necessitate citizens’ face-to-face interactions or close links with politicians. Consequently, the act of casting a ballot in itself does not threaten gang survival. This suggests that residents in neighborhoods dominated by gangs who want to change the status quo will be less fearful of gang retaliation if they turn out to vote than if they participate in nonelectoral political activities. Yet, I argue that it is unlikely that, on average, residents in these neighborhoods will vote at higher rates than those in neighborhoods with low gang dominance. My theoretical insights predict overall voter turnout rates to be similar across neighborhoods with varying degrees of gang control. I identify gangs’ incentives to manipulate electoral outcomes as one of the mechanisms that tends to equalize voter turnout rates across neighborhoods. As I discuss below, similar voter turnout rates does not signify equal opportunities to exercise freely the right of suffrage. This article identifies theoretical mechanisms through which gang control in neighborhoods affects residents’ political participation. It further offers the first systematic statistical analysis of the effects of gang dominance at the neighborhood level on political participation in the Latin American context. The data I use to test my hypotheses allow me to estimate multilevel models that account simultaneously for neighborhoods’ and residents’ characteristics. I compute a proxy measure of gang territorial control in Salvadoran neighborhoods and examine its effects on residents’ political participation, accounting for personal experiences with crime. Scholars have theorized that personal experiences with crime lead victims to participate at a higher rate in politics than nonvictims (e.g., Bateson 2012; Blattman 2009). Bateson (2012, 571, 572), for example, posits that crime victims get involved in politics for “emotional and expressive” reasons, including victims’ feelings of anger and need to associate with others as a coping mechanism after a traumatic event. Bateson’s (2012) comprehensive empirical assessment, based on survey data from seventy countries across Latin America, Africa, Asia, Europe, and North America, provides support for the hypothesis that personal experience with crime increases the probability of participating in nonelectoral political activities, including attending meetings of a political party or local government. This evidence suggests that crime victims turn to political participation as a mechanism to resist criminal violence. As Arjona (2017b, 764) puts it, experiences with violence can lead to “an awakening effect” and encourage social resistance. In the Latin American context, citizen mobilization to demand improvements in public safety from state institutions has become one of the manifestations of social resistance (Arias 2017; Davis 2012). Extant research, however, suggests that citizens’ likelihood of engaging freely in politics is largely determined by the extent and nature of criminal violence at the local level. For example, Arias (2017) indicates that territorial control by nonstate armed groups constrains civil society’s mobilization in the Latin American context. Similarly, in the context of Mexico, quantitative studies find that higher levels of criminal violence at the local level result in lower voter turnout rates (Ley 2018; Trelles and Carreras 2012). Trelles and Carreras (2012) theorize that, in municipalities with high homicide rates, fear of crime discourages citizens from leaving their homes and attending the polls. Moreover, the authors posit that, in these contexts, citizens are less likely to trust political institutions and consequently have little confidence in electoral processes. Ley (2018) contributes to this literature by demonstrating the importance of considering the nature of criminal violence in exploring its impacts on political behavior. Her findings show that criminal violence in general lowers voter turnout in Mexican municipalities, but especially when drug cartels target politicians during electoral campaigns, creating a threatening environment during elections. In addition, Ley’s (2018) empirical results suggest that criminal-electoral violence discourages voter turnout among both crime victims and nonvictims. In general, crime victimization does not appear to have a strong effect on voter turnout. This overview of the literature suggests that the context in which criminal violence occurs conditions its effect on political participation. To understand crime victims and nonvictims’ responses to criminal violence, it is important to consider the nature of violence and the modus operandi of local dominant criminal groups. Moreover, this overview suggests crime victimization has a distinct effect on electoral and nonelectoral modes of political participation. Examining the case of El Salvador, I identify mechanisms through which gangs’ control of neighborhoods affects crime victims and nonvictims propensity to participate in electoral and nonelectoral activities. Gang violence is widespread across impoverished neighborhoods in developed and developing countries (Rodgers 1999). In Latin America, the nature and strength of gangs vary across the region. While in most countries pandillas have local roots, maras in northern Central American countries originated in Los Angeles, California (Rodgers and Muggah 2009). The deportation of Mara Salvatrucha (MS-13) and Mara Dieciocho (Mara 18) members in the 1990s gave rise to maras in these countries. Unlike pandillas, which operate in specific areas and lack the organizational capacity to have a national impact, maras have positioned themselves as extremely violent criminal organizations with a national and international presence (Pedraza, Miller, and Cavallaro 2010). In the past few years, gangs in El Salvador expanded their membership, becoming much more powerful illicit nonstate actors (Cruz 2014). They have built more sophisticated criminal organizations with greater capacity for coordinating activities among members belonging to different clikas or cells (Pedraza, Miller, and Cavallaro 2010). Members of clikas are typically from the same neighborhood and are in change of territorial control. Data from the World Bank and El Salvador’s Ministry of Justice indicate that between 2008 and 2013 the number of clikas across the country grew from 381 to 1,955 (Santos 2013). The number of gang members nationwide is calculated to have increased from 12,500 to 29,325, or by 134.6 percent, during the same period. Recent information from the national police indicates that by June 2017, there were approximately 43,151 mareros in the streets and 21,436 others in prison (Valencia 2018). Data also indicate that almost half a million people in El Salvador have close ties to gang members, including their relatives and friends (Santos 2013). According to these statistics, approximately 7 percent of the population may be directly or indirectly associated with gangs in El Salvador. As in other countries, gang members in El Salvador are predominantly young adult males from low-income and dysfunctional families in poor neighborhoods (Wolf 2011). As Rodríguez and Sanabria (2007, 80) explain, the fact that gang members typically operate in the neighborhood where they grew up creates complex relationships between them and residents. Nongang residents express compassion for the youth in gangs, and at the same time they are fearful of being victimized by gang members residing in their neighborhood. I argue that the control gangs exert in neighborhoods results in lower political participation rates, particularly in nonelectoral activities. This does not mean residents prefer the status quo (i.e., living under gang rule). While gang members create a threatening environment for most residents in these neighborhoods, they lack the capacity to secure the loyalty of communities through the provision of goods and services. Unlike other criminal groups that exert territorial control, such as drug cartels, youth gangs in El Salvador and in other Central American countries do not have the financial capacity to take on state responsibilities at a large scale (Martínez et al. 2016). I argue that, rather than a preference for the status quo, at least three other mechanisms explain residents’ lower participation rates in nonelectoral activities in gang-controlled neighborhoods; in addition, although gang control might not alter voter turnout on average, it does undermine the right of citizens to cast a ballot without fearing violence or retaliation. Territorial control involves the strong presence in a given geographic area of an illicit armed group that has the capacity to restrain state and nonstate actors’ access to this area (Kalyvas 2006). Nonstate armed groups control territories as a survival and empowerment strategy. Territorial dominance increases their ability to protect themselves from the state and other rival actors and allows them to operate more freely and strengthen their organizations (Arjona 2017a). To control a territory, illicit armed groups require “massive obedience and some spontaneous support” from the population (Arjona 2017a, 46). Residents’ massive obedience (compliance) is achieved through what Kalyvas (2006) calls coercive violence. That is, nonstate armed groups turn to the use or threat of violence to deter residents from disobeying the rules imposed over them. I argue that, as gang members and others living in controlled neighborhoods seek to maximize their chances of survival, a confluence of gang’s actions and residents’ responses shape neighborhoods’ political life. Gang dominance in neighborhoods undermines one of the most important pillars of democracy: citizens’ right to participate freely in politics. My theoretical insights allows me to draw hypotheses on how the extent of gang control across neighborhoods affects overall participation rates among crime victims and nonvictims. As Kalyvas (2006) indicates, the probability of informing declines as the level of territorial control increases, because the risk of retaliation also goes up. Under these threatening conditions, crime victims and nonvictims are equally likely to be discouraged from interacting with state actors—not only the police but also institutions that work closely with law enforcement, such as local governments. With the implementation of decentralization reforms, local governments throughout Latin America now share responsibility with central governments to ensure citizen security. Important synergies between the police and municipal governments have emerged. For example, crime prevention programs at the local level have included the promotion of community policing (Arias and Ungar 2009). In El Salvador, the security program Plan Seguro has brought together the police and national and local governments in the eradication of gang violence (CNSCC 2015). In contexts of gang dominance, then, the threat of gang retaliation for maintaining ties with local and national government institutions is also high. The threat of gang violence is likely to offset possible benefits of engaging with or seeking help from state authorities for both crime victims and nonvictims. Gang dominance is also likely to depress nonelectoral participation through a second reinforcing mechanism—by discouraging participation in community improvement organizations. In the Latin American context, participation in community organizations is an important driver of political engagement (Espinal and Zhao 2015), including protest participation. Community organizations typically turn to state authorities for help to improve neighborhoods’ living conditions, including public security. Gangs have a strong incentive to discourage residents’ free participation in community organizations, because these can bring residents and state authorities together. In El Salvador, gangs have targeted community leaders, murdering at least twenty between 2016 and 2018 (Beltrán 2018). As a news report put it, “it is not that all the community associations and leaders are the eyes and ears of the police, but gang members perceive them as such” (Beltrán 2018). As a result, fear of gang retaliation discourages participation in community organizations, limiting residents’ communication channels with state authorities. In gang-dominated neighborhoods, fear of neighborhood violence also undermines community participation. To protect themselves from neighborhood violence, residents prefer to stay home rather than attend community events. Savenije’s (2009) account of his experience living in a gang-dominated neighborhood in San Salvador illustrates how fear of neighborhood violence undermines collective action: “Aware of the confrontations between rival gangs, the family advised me to stay at home … Even though residents were afraid of becoming victims, there were no collective efforts to reduce the conflict. Quite the opposite, even the sports committee that used to organize basketball and soccer matches stopped functioning” (Savenije 2009, vii–viii). Since it is almost impossible to be immune to the dangers gangs bring about, in gang-dominated neighborhoods fear of neighborhood violence is likely to undermine community participation among crime victims and nonvictims, which consequently results in a lower likelihood of interacting with political elites. The third mechanism I identify posits that gangs’ territorial control makes it more difficult for government representatives and political parties to mobilize citizens. Gangs restrict free movement within neighborhood borders, especially of nonresidents, in order to ensure territorial control (Savenije and van der Borgh 2015). Without the gang’s approval, simple movement across borders can be deadly for anyone. These constraints also apply to government authorities and party leaders, making it difficult to gain access to gang-dominated neighborhoods. Gangs have made the distribution of public services in Central American neighborhoods more difficult (Miraglia, Ochoa, and Briscoe 2012) and require elected officials, such as mayors and legislators, to request permission from local gangs to visit controlled territories (Martínez 2016). In El Salvador, political parties have also publicly denounced gangs as an obstacle for mobilizing neighborhood residents (El Mundo 2015). Political elites’ restricted access to gang-dominated neighborhoods is likely to further depress participation rates in nonelectoral activities among crime victims and nonvictims. Indeed, previous literature indicates that citizens are less likely to interact with political elites when “nobody asked” or encouraged them to do so (Brady, Verba, and Schlozman 1995, 271). H1: On average, crime victims engage at a higher rate in nonelectoral forms of political participation than nonvictims, ceteris paribus. H2: On average, residents living in gang-controlled neighborhoods engage at a lower rate in nonelectoral political activities than those living in neighborhoods with low gang dominance. H3: On average, in neighborhoods with low gang dominance, crime victims participate in nonelectoral politics at a higher rate than nonvictims. By contrast, in neighborhoods with high gang dominance, crime victims and nonvictims are similarly likely to participate in nonelectoral political activities. Casting a ballot is a relatively infrequent activity that does not require high levels of engagement or personal interactions with political elites. Consequently, voting in itself is less likely to result in informing about gang operations compared to engagement in nonelectoral activities. This suggests that residents in these neighborhoods might perceive voting as the only mechanism through which they can have a say in politics without the risk of gang retaliation. However, I argue that it is unlikely to find higher voter turnout rates in neighborhoods with high gang dominance compared to those less affected by gang control. To identify pathways through which gang dominance affects voter turnout rates it is important to take into account gangs’ and residents’ behaviors under two electoral neighborhood contexts: unrestricted and criminalized elections. By unrestricted elections, I mean national or municipal elections in which gangs dominating a given neighborhood are not actively engaged in the manipulation of electoral results by trying to change the voting intentions of neighbors. Criminalized elections in neighborhoods are those in which gangs exerting territorial control turn to coercive violence to alter the voting intentions of neighborhood residents. In a given national or municipal election, elections in gang-controlled neighborhoods can be unrestricted or criminalized, depending on gangs’ incentives and the presence or absence of fraudulent electoral arrangements with political parties. Although residents’ motivations to abstain or attend the polls differ under these two electoral neighborhood contexts, in both cases I expect to find similar voter turnout rates across neighborhoods with varying levels of gang control. When elections in gang-controlled neighborhoods are unrestricted, residents do not face a high risk of gang retaliation for attending the polls. Voting becomes a safer option of political mobilization for those who want to resist gang violence and change the status quo in gang-dominated neighborhoods, including crime victims. However, I argue that although some residents might be more inclined to vote in this context, at least three other neighborhood dynamics are likely to counterbalance this effect, resulting in similar voter turnout rates across neighborhoods with different degrees of territorial control. First, as mentioned above, in gang-controlled neighborhoods, fear of neighborhood violence makes residents less likely to leave their homes, lowering the probability of attending the polls. Second, political parties’ limited access to these neighborhoods undermine their ability to mobilize residents to go to the polls. Third, living in contexts of high violence is also likely to undermine residents’ confidence in political institutions (e.g., Trelles and Carreras 2012), which pushes voter turnout rates down. In short, although the risk of gang retaliation is low when elections are unrestricted, and some residents might feel compelled to vote, the factors described above will discourage others from doing so. As a result, voter turnout rates in gang-controlled neighborhoods with unrestricted electoral environments will not differ much from those in neighborhoods with low gang control. Moreover, it is unlikely to find substantive differences in the probability of casting a ballot between crime victims and nonvictims in neighborhoods with unrestricted elections. The results of previous studies (e.g., Bateson 2012; Ley 2018) suggest that, in general, crime victims appear more inclined to engage in nonelectoral than electoral forms of political participation. This might be explained in part by the perception that voting is a less effective strategy to bring about prompt improvements in personal safety than contacting political elites directly. Moreover, since the act of voting per se does not necessitate social interactions, it does not offer the opportunity to find the social support needed to cope with the psychological burden of crime victimization. Even if elections are criminalized in some gang-dominated neighborhoods, voter turnout rates in these neighborhoods and those with low gang dominance are likely to be similar. Collusion between political parties and criminal groups to manipulate electoral outcomes has undermined citizens’ right to vote freely for their preferred candidate across Latin America (Albarracín 2018; Arias 2017). In northern Central American countries, extensive reports have documented alliances between gangs and political parties and candidates in recent electoral campaigns (Dudley and Puerta 2017; Puerta, Silva, and Dudley 2017). As explained below, under criminalized elections gangs serve as intermediaries between political parties and residents in controlled neighborhoods. Consequently, residents’ free interaction with party leaders is still limited. This explains why we still might observe lower resident engagement with political parties in controlled neighborhoods in the context of criminalized elections. Gangs offer political candidates what no other broker or intermediary can provide—the use of coercive violence to sway elections in their favor. In the context of criminalized elections, fear of gang retaliation drives the decision of residents in gang-dominated neighborhoods to vote or not. In El Salvador, as in other countries in Latin America (e.g., Arias 2017), gang members have sought to influence electoral outcomes by coercing residents in controlled territories to vote for a given political party and deterring supporters of the opposition from attending the polls. Since negotiations between gangs and political actors are typically clandestine, it is difficult to determine the extent to which the outcome of a given election is the result of voter intimidation. Fear of gang retaliation influences voting behavior in the context of criminalized elections in neighborhoods. Gangs become political parties’ brokers in charge of mobilizing some neighborhood residents to the polls, while dissuading other from doing so. Given these two countervailing dynamics, I expect voter turnout rates in controlled neighborhoods subjected to a criminalized electoral environment to resemble voter turnout rates in neighborhoods with low gang dominance. These dynamics clearly erode citizens’ political rights and the significance of elections in democratic societies. When gangs intimidate residents during elections, fear of gang retaliation motivates crime victims and nonvictims to comply with gangs’ orders. H4: On average, crime victims and nonvictims are likely to vote at similar rates, ceteris paribus. H5: On average, residents living in gang-controlled neighborhoods are likely to vote at a similar rate compared to those living in neighborhoods with low gang dominance. To test my hypotheses, I rely on an original dataset that comprises census and public opinion data gathered between 2010 and 2011 in seventy-one neighborhoods spread over six municipalities in El Salvador: Chalchuapa, San Juan Opico, Santa Ana, Santa Tecla, Zaragoza, and the capital city, San Salvador. To design and execute the project, I spent over eighteen months in the field. During this time, I also gathered qualitative information from community leaders and officials in state and nongovernmental institutions. I carried out this project on behalf of the Latin American Public Opinion Project (LAPOP) hosted at Vanderbilt University. Similar to previous neighborhood studies (e.g., Huckfeldt and Sprague 1995), I selected neighborhoods randomly after stratifying the universe of neighborhoods in each municipality into two groups according to their socioeconomic characteristics—low and high poverty.2 This selection strategy resulted in great variation in other neighborhood characteristics, including reported levels of gang violence. To ensure the safety of interviewers, prior to the random selection of neighborhoods, with the help of the local police, neighborhoods where levels of violence had escalated were excluded from the list of eligible neighborhoods. Still, the final sample includes neighborhoods with high levels of reported gang presence and violence. Before initiating the data collection, neighborhood leaders helped identify neighborhood borders to make sure the fieldwork was carried out in the right locations. Thus, unlike submunicipal data collected by census bureaus, which are gathered in arbitrary predetermined areas (e.g., census tracts) that do not necessarily correspond to neighborhoods, the data employed in this study were collected within neighborhood borders. The census data collected resulted in observations for a total of 30,791 household members and 8,516 households. These data were employed to compute socioeconomic and demographic indicators at the neighborhood level and used as the sampling frame for the design of the public opinion survey. An important feature of the first survey item is that it asks explicitly about the presence of gangs living in the neighborhood. Gangs have a strong incentive to exert control over the neighborhoods where they live, because this increases their chances to survive. Controlled neighborhoods are clikas’ sanctuaries. Not surprisingly, in neighborhoods where clikas form, residents also report high incidence of gang fights. It is in these neighborhoods that gangs are particularly interested in keeping nonresidents out, including rival gangs. I argue that an index based on these two survey items captures some of the dynamics taking place in gang-controlled neighborhoods and therefore can be used to create a proxy measure of gang dominance at the neighborhood level. 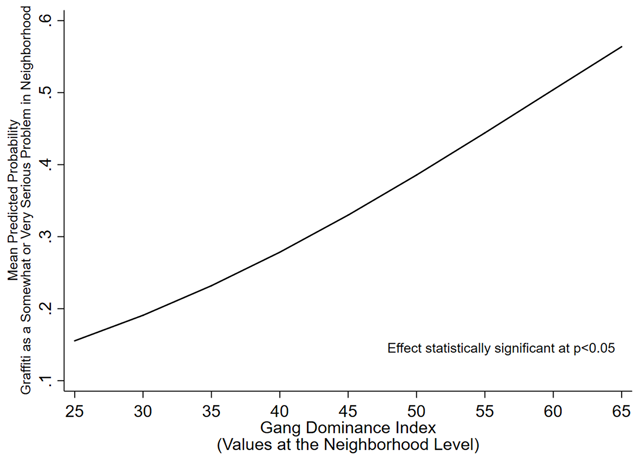 As shown below, the index is strongly correlated with other key characteristics of neighborhood control. To compute the index, I recoded original answers to the two survey questions into a 0–100 scale and estimated mean values for each respondent. Subsequently, I aggregated these values at the neighborhood level by computing the overall mean. In my sample, the index varies from about 24 to 65 points. Higher values on the index depict neighborhoods where law enforcement authorities have less control over the safety of residents and the local gang has gained more dominance. About 40 percent of respondents live in neighborhoods with values equal to 50 points or higher on the index, which represents about 34 percent of the total number of neighborhoods in my sample. Index validation: Graffiti as a problem. Figure 2 shows that the index is also correlated with expected resident behaviors. The gang dominance index captures the residents’ obedience to the “ver, oir, y callar” rule imposed by gangs in controlled territories. Residents in neighborhoods ranking high on the gang dominance index are significantly less likely to ask for help from the police (Panel A), even though they most fear being victims of crime (Panel B). In addition, residents in these neighborhoods are less likely to report seeing a neighbor talking to the police (Panel C), partly because residents avoid interactions with the police but also because the police avoid patrolling these neighborhoods unless they are heavy armed and conducting an operation jointly with the military. Taken together, these trends suggest the index is capturing not simply the extent of gang activity but also the degree of neighborhood control. In addition, as expected, the index is negatively correlated with the probability that residents will engage in activities organized by community organizations (Panel D), providing further evidence of gangs’ influence on resident behavior in controlled territories. Two additional validity checks increase my confidence that the index can be used as a proxy measure of neighborhood control. I reviewed information on neighborhood safety gathered from my interviews with the police and local government officials as well as fieldwork reports from interviewers. Based on this information, I found a high degree of correspondence between neighborhoods ranking high on the index and those identified by local actors and interviewers as some of the most affected by gangs’ territorial control. In addition, I find that the index correlates well with socioeconomic characteristics typically found in controlled neighborhoods (see Figures A1–A3). Data from a systematic observation of neighborhoods’ blocks, collected following the methodology of previous works (Sampson and Raudenbush 1999), indicate that neighborhoods ranking high on the index show a higher degree of deterioration of public spaces, including garbage in the streets and poor street lighting. Moreover, the percentage of households living in poverty is higher in these neighborhoods, and residents are more likely to report incidents of crime and violence within neighborhood borders, including extortions and sexual violence. Besides the gang dominance index, the second core independent variable is an individual-level variable on crime victimization, coded 1 if a respondent reported being a victim in the past twelve months of at least one type of crime on a list of ten criminal acts, or coded 0 otherwise. In addition, the models control for a series of neighborhood and individual-level variables. At the neighborhood level, I compute a measure of neighborhood crime based on a battery of questions in the survey asking respondents about the incidence of different crimes in their neighborhood. The models also account for the level of poverty, estimated based on the unsatisfied basic needs (UBN) methodology using the census data. Additionally, the models include a variable on neighborhood size, corresponding to the number of inhabited dwellings in each neighborhood according to the census. At the individual level, the models account for a variable on fear of crime, which allows me to control for the possibility that the gang dominance index is simply capturing the extent of fear of crime among individuals and not the extent of territorial control. In addition, the models control for two attitudinal variables identified in the literature as important determinants of participation—trust toward neighbors and interest in politics. To account for the well-established effect of socioeconomic status on participation, the models control for years of schooling and wealth computed based on household assets (Córdova 2009). Additionally, I add a control variable for the age of the respondent along with a quadratic term for age to capture the possibility of an inverted U-shaped relationship between age and participation. Finally, gender is coded 1 for female and 0 for male respondents. 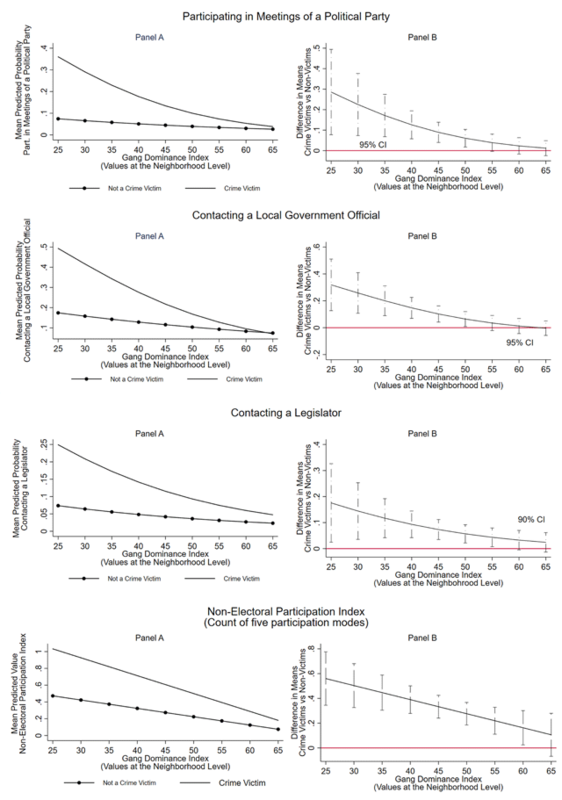 First, I test hypotheses H1–H3 for each of three forms of nonelectoral participation. The first dependent variable corresponds to an item in the neighborhood-based public opinion survey on frequency of participation in meetings of a political party. The other two items ask respondents whether they have requested help from a local government official or a national legislator, respectively. About 5 percent of respondents said they participate in meetings of a political party at least once a year. The percentage who said they requested help from the local government is equal to 12.2, while only 4.5 percent requested help from a legislator. Although the survey includes two additional items on nonelectoral participation (protest and help requests from a state ministry), only the three aforementioned items allow me to split the sample for each variable into crime victims and nonvictims and still have enough cases in each cell, as needed for testing H3. Protest and help requests from a state ministry are the least frequent modes of political participation, with only 2.5 and 3.4 percent of respondents engaging in these two activities, respectively. Still, as shown in the online appendix (Table A11), when I explore the average effect of crime victimization (H1) and gang dominance (H2) on protest participation or help requests from a state ministry, I find similar patterns to those shown in Table 1 (Models 1–3). + p < 0.10; * p < 0.05; ** p < 0.01; *** p < 0.001 (Standard errors in parentheses). Fixed effects at the municipal level included but not shown. To test all three hypotheses (H1–H3) accounting for protest participation and help requests from a state ministry, I implement an alternative strategy. I employ as a dependent variable a count index based on all five forms of nonelectoral participation. The index registers the total number of nonelectoral activities in which each respondent participates. In the sample, the index ranges from 0 to 5. Finally, I test the effect of neighborhood dominance on electoral participation using an item on voter turnout included in the neighborhood survey. Voter turnout is coded 1 if respondents cast a ballot in the 2009 election or 0 if they did not vote. In addition, to explore the effect of personal experiences with crime on electoral participation, I employ an item on voting intentions included in the 2010 nationally representative LAPOP survey for El Salvador. This variable is coded 1 if individuals indicated they would cast a ballot if the next presidential election were held this week or 0 if they would not vote. Together, these two items allow me to test H4–H5. where αnXnj are neighborhood-level control variables, βnXnij are individual-level control variables, and εij is an error term. The first four columns of Table 1 show the results associated with the baseline multilevel models. As can be observed, the individual-level results in Models 1–4 show that crime victimization has a positive and statistically significant average effect on each dependent variable. Moreover, the coefficient associated with the gang dominance index is negative and statistically significant in these first four models. Taken together, these results provide strong support for H1 and H2. To examine the magnitude of the effect of gang dominance, I estimate predicted means at different values of the index and present the results graphically in Panels A of Figure 3. In Panels B, I perform difference in means tests by comparing the predicted mean at the lowest value of the gang dominance index (=25) to the predicted mean at higher values of the index.8 If the 95 percent confidence intervals associated with differences in means do not cross the solid horizontal line set at zero, it indicates differences in means are statistically significant. Effect of gang dominance on nonelectoral participation. Results based on Models 1–4 in Table 1. 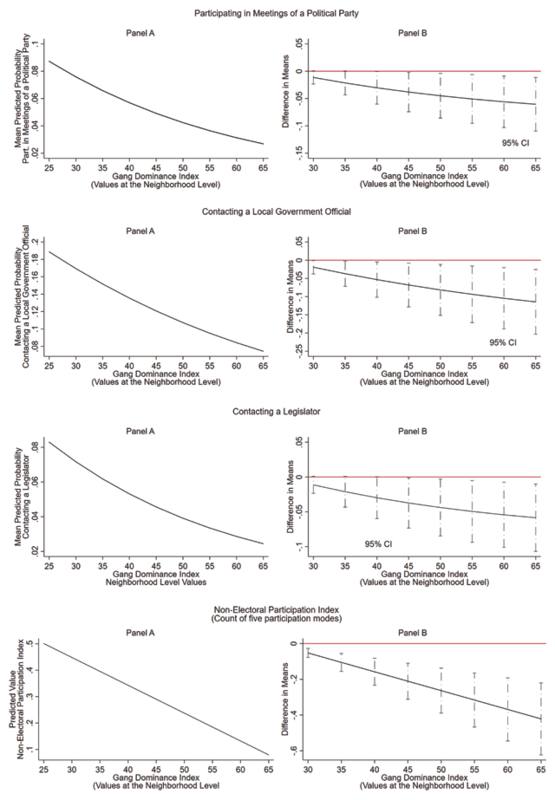 Figure 3 shows that, as the gang-dominance index takes higher values, the probability of participating in meetings of a political party, contacting a local government official, or legislator declines sharply (see Panels A). As one moves from the lowest to the highest value of the index, the probability of engaging in each of these political activities declines by 6.0, 11.5, and 5.9 percent, respectively. As can be observed in Panels B, these differences are statistically significant at p < 0.05. Moreover, we observe a similar trend when I use the count index as a dependent variable. The average number of nonelectoral activities residents participate in is significantly lower in neighborhoods with high gang dominance. 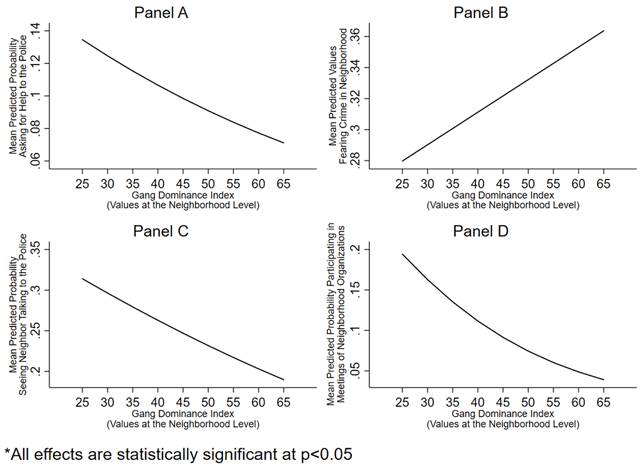 Models 1–4 in Table 1 show that living in neighborhoods with high gang dominance and being a victim of crime have opposite independent effects on nonelectoral participation. To understand the behavioral patterns of crime victims and nonvictims in neighborhoods with low and high gang dominance (i.e., test H3), I estimate multilevel models that interact the gang dominance index and crime victimization variables. The results are presented in Table 1, Models 5–8. To determine the substantive effects associated with interactive models, all constituent terms of an interaction have to be taken into account simultaneously, which makes it necessary to present the results in terms of predicted values. The graphical representation of the results depicts very consistent patterns across dependent variables (see Figure 4). Crime victims’ and nonvictims’ participation in nonelectoral activities. Results based on Models 5–8 in Table 1. Panels A in Figure 4 show the predicted means of nonelectoral participation for crime victims and nonvictims across values of the gang dominance index. Panels B test the statistical significance of differences in predicted means between crime victims and nonvictims at a given value of the gang dominance index. As can be observed, at low levels of gang dominance, crime victims are more participatory than nonvictims (see Panels A). However, as the gang dominance index takes higher values, the probability of getting involved in nonelectoral activities drops for both crime victims and nonvictims. Panel B in Figure 4 shows that differences in predicted means between crime victims and nonvictims are statistically significant at conventional levels when gang dominance is low. At the lowest level of gang dominance, crime victims are on average 28.6 percent more likely than nonvictims to participate in meetings of a political party at least once a year. Similarly, crime victims are 30.9 and 17.6 percent more likely to contact a local government official or a legislator, respectively. Moreover, the average number of nonelectoral activities in which victims engaged is about 0.5 points higher. By contrast, when the dominance index takes the highest value, differences in participation rates between crime victims and nonvictims are indistinguishable from zero. These results give strong support to H3. Crime victimization encourages nonelectoral participation, but only in neighborhoods with low gang territorial control. To test hypotheses H4–H5, I use two variables on electoral participation. The first one corresponds to an item in the neighborhood survey that asks respondents if they voted in the 2009 general election. This item allows me to examine the effect of gang dominance on voter turnout rates at the neighborhood level. However, it does not allow me to test the effect of crime victimization on voter turnout, because the neighborhood survey was carried out more than twelve months after the election. The victimization variable asks for crime experiences within the past twelve months. Consequently, I cannot directly test whether prior experiences with crime victimization influence future voting behavior. To evaluate the effect of crime victimization, I use as a dependent variable an item on voting intentions included in the 2010 LAPOP national survey. As shown in Table 2, Model 1, the sign of the coefficient associated with the gang dominance index is negative, but it is not statistically significant. Moreover, Model 2 shows that crime victimization does not affect an individual’s intention to vote. Fear of crime, however, is negatively associated with voting intentions, but this effect is not very strong. Instead, we observe that conventional factors associated with voting behavior consistently predict past voting behavior and intentions to vote. Respondents’ age and psychological predispositions toward politics, particularly interest in politics, predict both dependent variables. In short, my findings support H4 and H5. Voter turnout rates are similar across neighborhoods with varying degrees of gang dominance, and crime victims and nonvictims are similarly inclined to vote. Yet, as theorized above, similar voter turnout rates across neighborhoods does not signify that gang dominance does not constrain individuals’ freedom to cast a ballot. In the context of both unrestricted and criminalized elections, residents in neighborhoods with high gang dominance face constraints to turn out to the polls. Fixed effects at the municipal level included in Model 1 but not shown. + p < 0.10; * p < 0.05; ** p < 0.01; *** p < 0.001 (standard errors in parentheses). First, I test whether the average positive effect of crime victimization on nonelectoral participation is the product of an endogeneity issue. Individuals who are highly participatory might be more likely to be victimized by crime and not the other way around. To explore this possibility, I rely on the augmented inverse propensity weighted (AIPW) estimator procedure (Glynn and Quinn 2010). After conditioning crime victimization on a series of covariates, including individuals’ participation in neighborhood committees, the average treatment effect (ATE) of crime victimization is positive and statistically significant for each dependent variable in Table 1 (see Table A11). That is, crime victimization appears to cause nonelectoral participation. Another concern is that individuals who are more likely to answer sensitive questions and admit they have been victims of crime share psychological predispositions that also make them more inclined to participate in politics (e.g., Boulding and Mullenax 2017). If this were the case, the relationship between crime victimization and political participation would be spurious. I do not find evidence that the main conclusions of this research are affected by this possibility. As shown in Figure 4, individuals reporting crime victimization have the same propensity of engaging in nonelectoral activities as nonvictims when they live in neighborhoods dominated by gangs. Moreover, I do not find that this effect is the result of a lower probability of reporting crime victimization in gang-controlled neighborhoods. Residents in these neighborhoods are as likely to report being victims of crime. However, they report a higher frequency of crime victimization (see Table A12). In addition, when I conduct a placebo test and predict voter turnout as a function of reported crime experiences after the election, I do not find a statistically significant effect. This suggests that, at least in the context of El Salvador, the crime victimization variable is not mainly reflecting psychological predispositions correlated with political participation (see Table A14). Second, I assess whether low political engagement leads to a higher rate of gang dominance in neighborhoods, and not the other way around. The evidence presented above suggests that this is unlikely to be the case. If the findings for nonelectoral participation were the result of endogeneity, most likely we would find that gang dominance is also associated with lower engagement in electoral participation. However, as shown above, voter turnout is similar across neighborhoods with different degrees of gang dominance. Additionally, when I examine residents’ level of interest in politics, an important predictor of political participation, I find similar levels across neighborhoods with varying degrees of gang dominance (see Table A15). This result suggests that if they did not fear gang violence, residents in neighborhoods controlled by gangs would be more inclined to engage in nonelectoral activities. I also explore the possibility that residents’ decision to avoid interactions with political elites in gang-dominated neighborhoods is not associated with fear of gang retaliation but results from residents’ inclination to defend the interests of the gang and protect its members from the police. To assess this possibility, I examine residents’ attitudes toward the police across neighborhoods with different levels of gang dominance. The neighborhood survey allows me to examine two dependent variables: trust in the police and demand for police involvement in the neighborhood. The results show that attitudes toward the police do not vary by levels of gang dominance (see Tables A16–17). Residents in neighborhoods dominated by gangs are similarly likely to demand police intervention and trust the police as those living in neighborhoods not controlled by gangs. In short, I do not find evidence that the lower levels of nonelectoral participation in neighborhoods dominated by gangs is simply the result of collusion between residents and gang members. To further examine the robustness of my results, I employ an alternative dataset and measure of gang dominance. The 2016 nationally representative LAPOP survey for El Salvador includes an item that asks interviewers to report on the local conditions of the place where they carried out each interview. One of the questions asks to what extent the surroundings of the interviewee’s household is affected by graffiti on the walls by gangs. Based on this variable, I compute an indicator of gang dominance at the census track level. The 2016 survey includes two dependent variables I explore in this article, participation in meetings of a political party and voting in the past presidential election. Using this alternative indicator of gang dominance yields results consistent with those presented above. Visible signs of gang dominance in the place of residence, as measured by graffiti, is associated with a lower probability of participating in meetings of a political party, but it does not have an effect on voting (See Table A17). Criminal violence poses great challenges for democracy in Latin America. Evidence from El Salvador demonstrates that gangs’ territorial control has resulted in subnational territories of “low intensity citizenship” (O’Donnell 2010), where citizens face constraints to exercise their political rights. Political participation is limited under conditions of gang dominance, resulting in unequal democracies where only privileged citizens who can afford to reside in well-off neighborhoods can freely engage in politics. Consequently, resisting gang violence through institutionalized political channels becomes less feasible in micro-spaces ruled by gangs. First, engagement in political activities that involved direct contacts with political elites pose a high risk of gang retaliation in controlled neighborhoods. To deter residents’ political engagement and contact with law enforcement authorities, gangs also discourage community participation. Second, even when voting does not pose a high threat of gang retaliation, and some residents in these neighborhoods might have a strong incentive to attend the polls, fear of neighborhood violence and distrust in government are likely to discourage others from doing so. Moreover, in the context of criminalized elections, gangs attempt to alter electoral outcomes by obligating some residents and discouraging others to turn out to vote. Although voter turnout rates are similar across neighborhoods with varying degrees of gang dominance, residents’ motivations for voting or abstaining from voting are different. Further, this article demonstrates that the positive effect of crime victimization on nonelectoral participation reported in previous studies is conditional on neighborhood context. In gang-controlled neighborhoods, crime victims and nonvictims show a similar propensity to engage in nonelectoral activities. By contrast, in neighborhoods not dominated by gangs, crime victims are much more likely to engage in nonelectoral activities than nonvictims. The results also suggest that personal experience with crime is less consequential for making a decision to vote compared to its effect on nonelectoral participation. Even if voting does not involve a high threat of gang retaliation in a given election, crime victims might not perceive voting as an effective strategy to cope with the victimization experience and improve their personal safety promptly. The results of this research highlight the importance of examining neighborhood-level dynamics to advance our knowledge on how citizens form decisions to participate in politics in contexts of gang violence. This article echoes previous studies’ suggestion of unpacking the “political dynamics within cities” to broaden our understanding of the effects of criminal violence (Moncada 2016, 242). Accounting for the extent of gang dominance in neighborhoods allows us to explain why residents in some neighborhoods participate more than in others and why crime victimization does not always result in higher political participation. Moreover, neighborhood dynamics help identify which forms of political participation are most affected by the threat of gang retaliation. The evidence presented in this article also carries with it an important policy implication: in countries threatened by gang violence, crime prevention and development programs are unlikely to improve citizen safety and local democracy unless interventions take into account submunicipal inequalities and target the neighborhoods most vulnerable to gangs’ territorial control. As previous studies have shown (e.g., Freire 2018), well-designed policies can reduce crime and violence in the Latin American context.